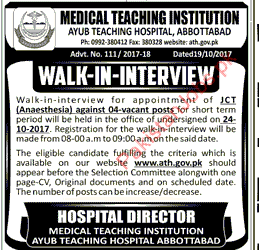 Medical Teaching Institution Ayub Medical College is looking for Junior Clinical Technician Anesthesia.Interested candidate can apply. candidate must have experience in relevant field. Attractive salary will be given.